Pen patterns exercises pave the way for skill with the broad-edged pen and provide simple ideas for border decorations before you embark on letters. They also introduce you to the notion of a constant pen angle. 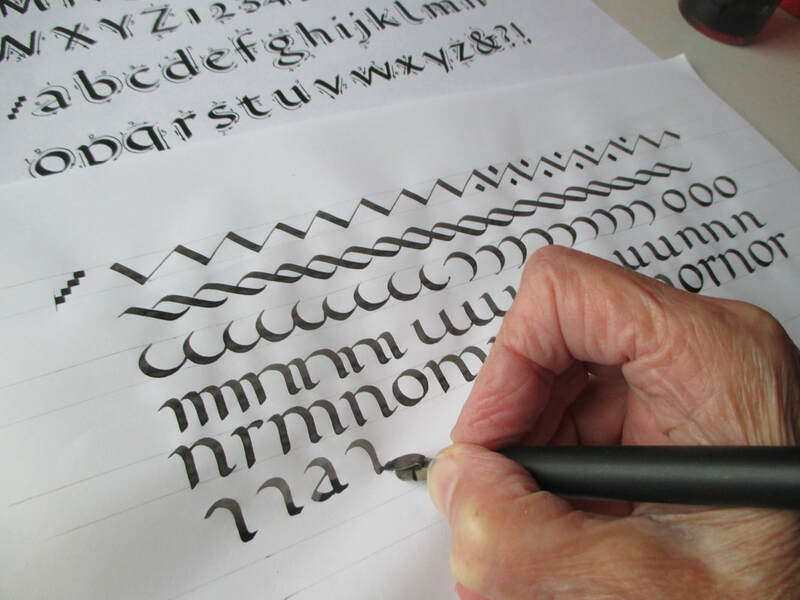 The lower-case will be practiced in groups of letters with the same strokes, to reinforce the notion of a ‘matching set’ and to develop a writing flow. Letter and word spacing follow, then looking at the Capitals. If you’re experienced but rusty, you’ll fly through these and move on to arranging a quote on a page or trying out variations. Everyone will aim to take home some labels, or signs, or a quote, to show how you can apply what you’ve learned, and to encourage you to pursue it further at your leisure. Removing bad habits if ‘rusty’! Materials are not included in your course fee. Some materials will be provided by the tutor. The approximate cost of these will be £7, payable to the tutor during the course. Pencil, ruler, eraser, and a notebook if you like to make notes to help you learn. Your reading glasses if you need them!